For more than a year, nearly 850 construction workers have been furiously transforming 27 acres of once-abandoned lots in downtown Miami into one of the biggest developments in city history. Within the sprawling $4 billion Miami Worldcenter project, work crews have completed a 444-unit rental apartment tower called Caoba while putting the finishing touches on the 60-floor luxury condominium Paramount Miami Worldcenter and starting on the first phase of the development’s open-air retail and restaurant complex. 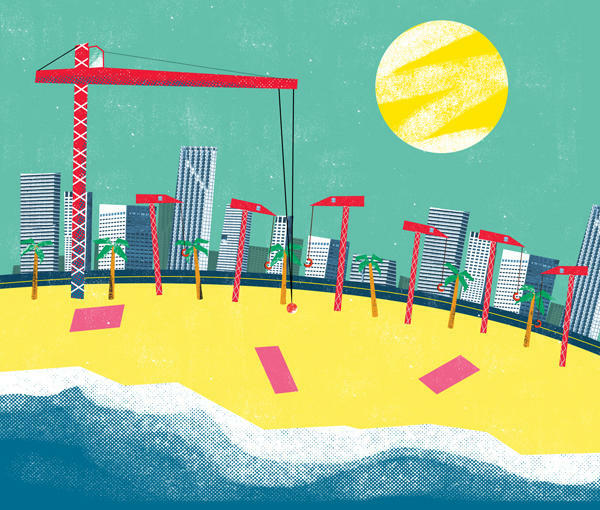 In total, they built about 1.25 million square feet of the Miami Worldcenter development last year, placing a joint venture between Coastal Construction and AECOM Tishman — the general contractors managing the massive project — first among construction firms that built the most square footage in Miami in 2018, according to The Real Deal’s ranking of builders operating in the city. Once completed, the massive project’s first phase will be close to 4 million square feet. It could possibly add 4 million more in subsequent phases on 10 city blocks owned by developers Art Falcone and Nitin Motwani — who have a number of partners that include CIM Group, Paramount developer Dan Kodsi, citizenM and others. 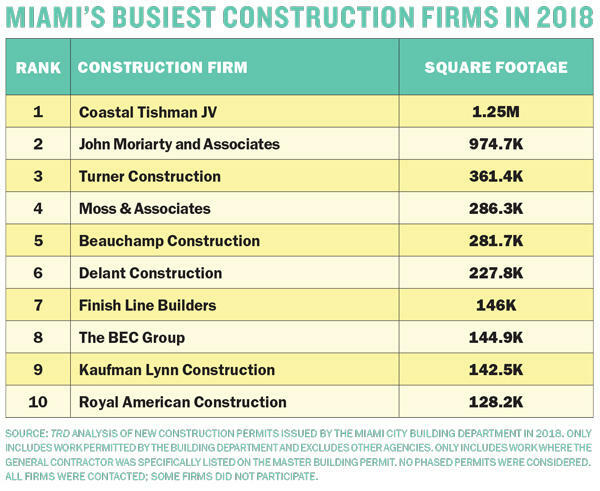 For the big construction firms like the Coastal-Tishman team, 2018 was a very busy year for erecting new buildings in Miami. From Brickell Avenue to Wynwood, the contractors worked on a slew of signature projects, including Brickell Flatiron, the SLS Lux Brickell, Wynwood 25 and the Bradley, to name a few. This month, TRD analyzed all new master building permits issued in 2018 by the city’s Building Department to determine which firms had the most work last year. Only master permits that specifically listed the general contractor were used in the analysis. No phased permits were considered. Coastal has been busy building luxury residential projects that are close to selling out units, Murphy said. The mixed-use Miami Worldcenter, for example, is the biggest construction site in Florida and will remain so until 2021, when the first phase is supposed to be finished. Paramount, the project’s condominium, has sold out 85 percent of its more than 500 units. In addition to Miami Worldcenter, Coastal had more than 10 million square feet under contract throughout Miami-Dade County last year, Murphy said. The firm broke ground on the Estates at Acqualina in Sunny Isles Beach and is halfway through construction of Aston Martin Residences in Downtown Miami. In January, Coastal began work on MiMo Bay Apartments in Miami’s Upper Eastside and University Bridge Residences, a student housing apartment tower near Florida International University’s main campus. According to a 2019 construction outlook report by Dodge Data and Analytics, U.S. construction starts for 2019 will be $808 billion, essentially the same as it was in 2018. The Dodge report predicts multifamily and commercial building construction will dip by 8 percent and 3 percent, respectively, compared to 2018. Dodge also said that the construction of offices, warehouses and hotels will also fall back, while the building of educational, health care, public works and amusement-related facilities will experience slight increases. Among the projects that made Moss and Associates the No. 4 firm for square footage in 2018 was SLS Lux Brickell, a 57-story luxury tower by the Related Group. Moss finished construction in April. Nine months later, Moss and Associates topped off Brickell Flatiron, Ugo Colombo’s 64-story condominium two blocks south of SLS Lux. Outside Miami’s city limits, Moss and Associates completed the 235-unit Harbour condominium in North Miami Beach and finished construction of the tennis facility at Hard Rock Stadium in Miami Gardens. The facility is the new home for the Miami Open. According to the TRD analysis of permits, John Moriarty and Associates, a New England-based company that does work throughout Florida, took second place by completing 974,700 square feet in 2018. Third-place finisher Turner Construction completed 361,400 square feet. Fort Lauderdale-based Moss and Associates and Miami-based Beauchamp Construction round out the top five with 286,300 square feet and 281,700 square feet, respectively. Executives for John Moriarty, Turner and Beauchamp did not respond to requests for interviews. In a statement, Anirban Basu, ABC’s chief economist, said the average price for steel and softwood lumber, two products impacted by U.S. tariffs implemented by the Trump administration last year, decreased by 1 percent and 0.8 percent, respectively, in January. Prices for natural gas and unprocessed energy materials slipped 32.2 percent and 19 percent, respectively, Basu added. That puts builders on a better footing than where they were at this time last year. By the second half of 2018, the global economy softened, helping to push down the prices for oil, copper and other key construction-related commodities, Basu explained. It has also helped that President Donald Trump continues to delay increasing tariffs to 25 percent from 10 percent. To attract new workers into construction trades, general contractors will have to increase wages, which in turn means projects could become more expensive to build. “It could lead to either a slowdown or an inflation in construction prices,” Dyga said.